The official Fall season is one week old today. Even though the weather here in the south isn’t very Fall-like yet, there’s another way to tell that it’s Fall. Squash. I was given these beauties by the Hankins family. They gave me even more, but I gave some to the neighbor. Luckily tomorrow is my turn to make the supper swap dinner. Have you ever seen such huge zucchini? 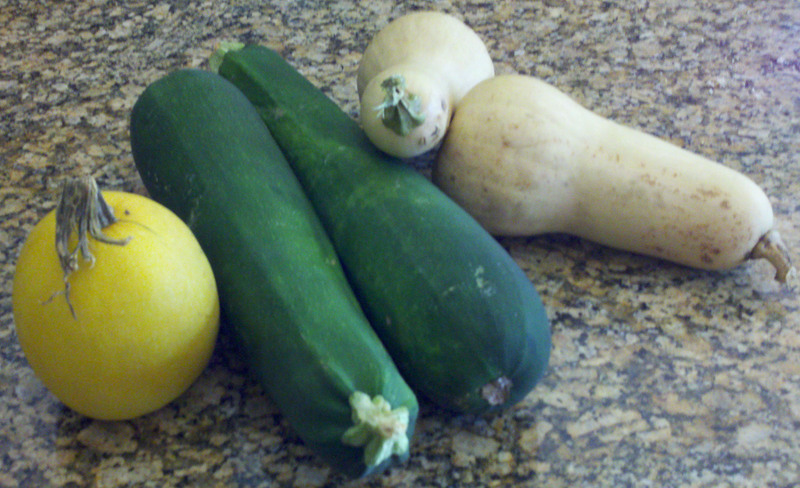 In the midst of trying to figure out what to make from these, I started wondering how squash got it’s name. I found the answer on the Everyday Mysteries website from the Library of Congress. According to the site, “‘Squash’ comes from the Narragansett Native American word askutasquash, which means ‘eaten raw or uncooked. '” (Don’t worry, fellow supper swappers – I’ll be cooking our squash.) I also learned that squash is one of the oldest crops, dating back over 10,000 years; and that the first pumpkin pie was a hollowed out pumpkin filled with apples, spices, sugar, and milk. Hmmm….I think I know what I’m going to make tomorrow for supper! And, if , like me, you are completely inept in the kitchen, especially when it comes to cutting and slicing things, my friend Kristen has a great vlog (that’s a video blog) post on How to Peel and Cut Butternut Squash (without loosing a finger!). Check it out. I’ll try and find out where she got that mammoth vegetable peeler.